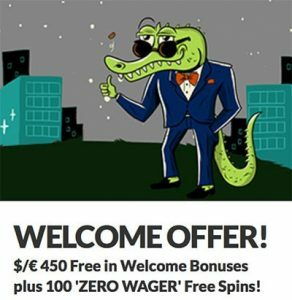 Find out more about House of Jack, a leading multi-provider casino site that offers hundreds of online pokies from the likes of BetSoft, Quickspin, Play'n Go and Spigo, while being hosted by one smooth-talkin' crocodile. We cover House of Jack's bonus offers, real money deposit options, software, security and customer service options to see why this has become such a trusted site for online slot fans. For our international readers, “pokies” is an Australian slang term for slot machines. All information that refers to pokies across this review and the rest of our site is completely interchangeable with the word slots – both mean exactly the same thing. Check out our pokies terminology guide for more slots-related lingo. Note: Winnings made from bonus money are limited to a maximum withdrawal of $5000 and expire 30 days from the date of issue. Bonuses that form the welcome package are subject to a 50X wagering requirement, which is one of the larger play-through requirements imposed by our recommended casinos so we strongly recommend players read the terms and conditions at House of Jack carefully before transferring real money. In addition to the welcome bonuses, head on over to the ‘Promotions’ tab at House of Jack at any time to see what ongoing and one-off bonus offers are available to registered players. House of Jack is quick to reward player loyalty and give players an incentive to come back time and time again, with daily offers that include free spins, mystery bonuses and matched deposits. You’ll also find seasonal offers to celebrate certain holidays, and promo offers available for new game releases. It’s this commitment to player engagement and rewards that puts House of Jack so high up our list of recommended casino sites. Want to play online but don’t want to download any casino software? Not a problem, House of Jack is powered 100% in instant-play mode, which means you can play games directly over your Web browser with no downloads required. 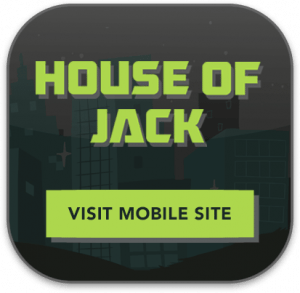 House of Jack is compatible with Safari, Chrome, Firefox, Explorer, Edge and all other major browsers, with games quick to load provided you have a reliable Internet connection with adequate Flash software installed. The House of Jack mobile platform is also download-free, and offers a convenient portable platform to play over 140 leading online pokies on the go. Mobile games are displayed in easy single-click thumbnails and being an instant-play site, games are compatible with all major smartphone and tablet makes and models provided you have a secure Internet connection. The progressive jackpot game selection is mostly limited to BetSoft’s local area progressives, which account for some of House of Jack’s best games including It Came from Venus, A Night in Paris, Enchanted, Mr Vegas, Tycoons, Mega Glam Life, Treasure Room and more. If you’re looking for a break from the pokies, House of Jack also offers a large selection of table games, number games, niche games and casino classics. There are multiple blackjack variants, including Single Deck Blackjack, Double Exposure, Pontoon, Pirate 21 and Super 7 Blackjack, while roulette fans can choose between European Roulette, American Roulette, Zoom Roulette and Common Draw Roulette. There’s also a range of video poker and table poker variants and a handful of online scratch cards. These deposit options provide a well-rounded list of payment methods that are sure to suit most players, with deposits accepted using multiple currencies. The withdrawal options are limited to Visa, Neteller, Skrill, Instadebit and ecoPayz only, with Visa and Instadebit withdrawals taking 3 to 5 days to process. All payments and transactions at House of Jack are protected by 128 Bit SSL (secure socket layer) digital encryption security to ensure players personal information is protected at all times. Account verification with proof of identity is also required by all players prior to withdrawing winnings.